Lawrence Gray Grundler, 86, of Hannibal, Mo. passed away at 8:20 p.m. Saturday, October 22, 2016, at Beth Haven Nursing Home. Funeral services will be held 11:00 a.m. Friday, October 28, 2016 at the Smith Funeral Home & Chapel. Pastor Tom Lemons will officiate. Burial with full military honors provided by the Emmette J. Shields American Legion Post #55 will be in the Riverside Cemetery. Visitation will be held 10:00 a.m. until the time of the service Friday at the Smith Funeral Home & Chapel. Lawrence was born on September 14, 1930 in Gary, IN. the son of Edward Frank and Adda Lee (Samples) Grundler. He married Patricia Ann Harms on May 28, 1954, in Brook, IN. She preceded him in death on December 28, 2013. Survivors include two daughters; Jane Danielsons and husband Peter of Hannibal, MO and Judy Grundler and friend Gary Kirfman of Columbia, MO; two granddaughters, Emily Danielsons and Elisabeth Danielsons. In addition to his parents and wife, Mr. Grundler was preceded in death by a brother, Norman Grundler. Lawrence graduated from Merrillville Indiana High School. He went on to his further education at Purdue University and graduated in 1952 with a bachelor's degree in Agriculture and later received his master's degree in Education from Purdue University. Lawrence served his country in the Army during the Korean War. Mr. Grundler was a member of the First United Methodist Church in Hannibal. 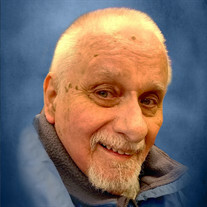 He enjoyed reading, crossword puzzles, computers, and was an amateur photographer. Lawrence also enjoyed watching the river boats coming in and out of Hannibal. Most of all he enjoyed spending time with his family. He was always there to attend his daughters and granddaughters recitals, concerts, musicals and plays. Memorial contributions may be made to the First United Methodist Church, Beth Haven Nursing Home or the Alzheimer's Association, in care of the Smith Funeral Home & Chapel. Online condolences may be made to the family and video tribute viewed at www.smithfuneralhomeandchapel.com.